I got 12 canning jars for $12 USD at Berkeley Bowl in Berkeley, CA. 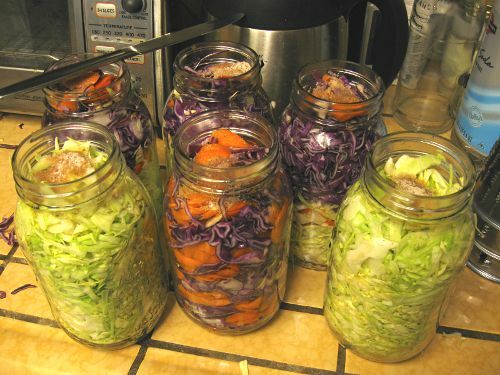 Three cabbages will fill six or seven jars. That might sound like a lot, but if you like sauerkraut, six jars will rapidly be eaten. Grate carrots for a coleslaw-like kraut. Other vegetables I’ve added include onions, garlic, seaweed, greens, Brussels sprouts, small whole heads of cabbage, turnips, beets, and burdock roots. You can also add fruits (apples, whole or sliced, are classic), and herbs and spices (caraway seeds, dill seeds, celery seeds, and juniper berries are classic, but anything you like will work). Experiment. 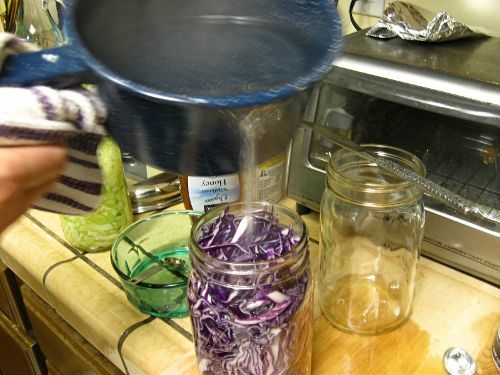 Sterilize the jars by putting the jars and lids in a large pot of cold water and bringing water to a boil for 10 minutes. 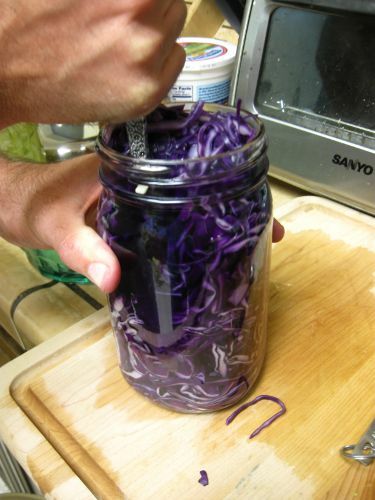 Jars can also be sterilized in the oven by slowly heating them to 225 degrees F for 10 minutes. Let the jars cool before filling them. Be careful when heating up or cooling down glass because the glass will break if it isn’t done slowly. It's dangerous to just drop cold glass jars into boiling water or cool down hot jars with cold water. Also be extremely careful with hot jars so that you don't get burned. 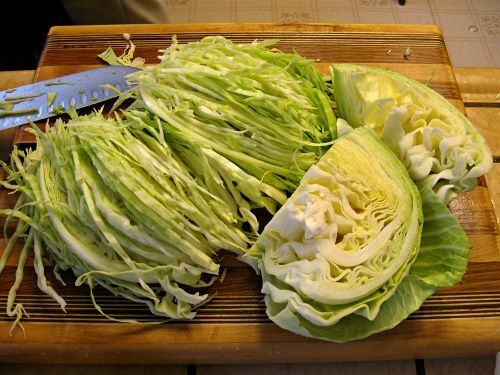 Cut cabbages into quarters and then slice thinly. The cookbook recommends slicing the cabbage about the thickness of a dime, but we sliced it a little bit thicker than that. 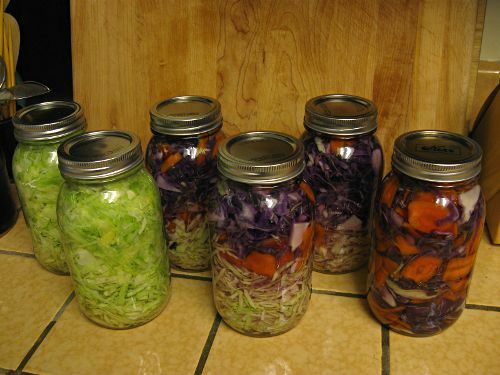 Fill the jars with cabbage and compress it fairly tightly, but leave about a half-inch of space at the top. Slowly pour boiling water over the cabbage. The boiling water will dissolve the honey and salt and distribute them in the jar. Use a dull knife to work out any air bubbles. 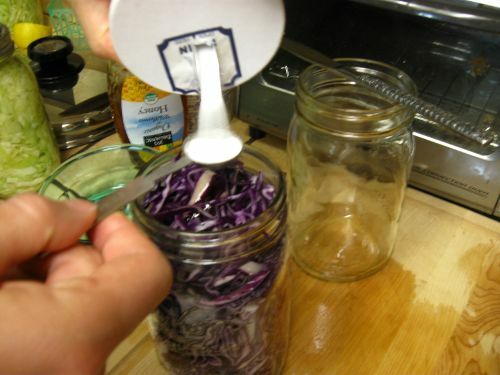 Leave about a half an inch of space at the top of the jar, while making sure that the cabbage is covered with water. 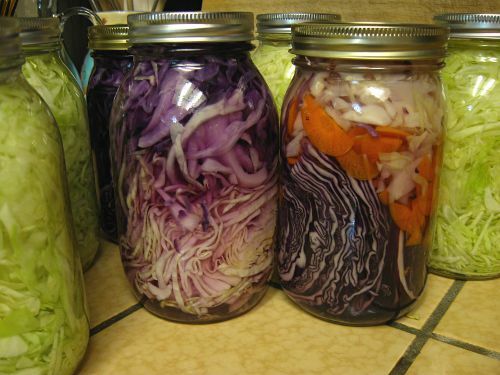 Cap the jar tightly, and put in a dark place that is about 65-70 degrees F. The jars may leak fermented cabbage juice, so be careful where you place the jars, and check them every few days. We’ve been keeping them in a baking pan under the kitchen counter. We used to open the sauerkraut after two weeks and it was tasty. It's even better if opened at six weeks. The cookbook says that it's ready after six weeks, and if you are going to store it for longer than a month after that, the jars have to be processed by boiling the jars in water for 20 minutes. I've never done that before because the sauerkraut is eaten so quickly. The fermentation process has three phases. In the first phase, anaerobic bacteria such as Klebsiella and Enterobacter lead the fermentation, and begin producing an acidic environment that favours later bacteria. The second phase starts as the acid levels become too high for many bacteria, and Leuconostoc mesenteroides and other Leuconostoc spp. take dominance. In the third phase, various Lactobacillus species including L. brevis and L. plantarum ferment any remaining sugars, further lowering the pH. 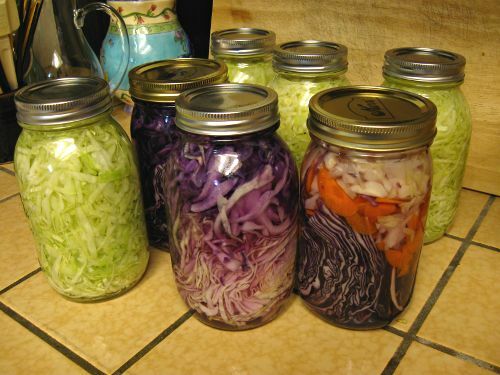 If everything goes as planned, you should end up with a few week's supply of delicious and healthy sauerkraut!